Different from the ordinary alarm clock, AMIR Projection Clock will do more than just display time. It is multi-functional on this basis. It has 6.5-inch extra-large LED screen display fully meeting your visual with the light brightness adjustable. AMIR Projection Clock does not occupy much space, fits perfectly in your bedside table or office table. It offers time display, time projection, dual alarms, snooze, FM radio, radio sleep timer, USB charging port and so on. Because of the 180° adjustable projection angle function, time can be projected onto the ceiling, wall or everywhere of your bedroom. Such user-friendly design, even if you are lying in bed, you can read time easily. Besides the blue projection light is soft and the brightness is adjustable. With the FM radio clock features, you can store up to 10 preset FM stations (FM: 76.0-108.0MHz) and set a sleep timer that allows you to fall asleep with your favorite one and access them quickly. Nature sound of the alarm wakes you up in the morning, and snooze function gives you extra 9minutes of sleep without any operation. Alarm function ensures you to wake up with buzzer or radio, snooze button allows 5-60 extra minutes of sleep. With a USB charging port that allows your mobile phone and other smart devices are connected to this item automatically charge. Delicate, compact and functional designs are user-friendly, logical clearly, and all the operating buttons easy to use. 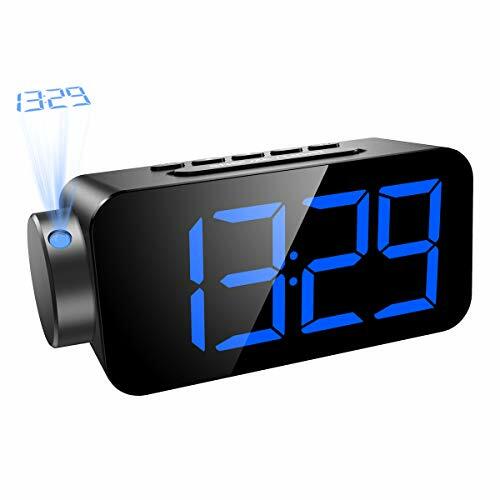 ➤【6.5 Inch Ultra-Clear Projection Alarm Clock】- 6.5" extra-large LED screen display fully meeting your visual need, a blue font and the data shows clearly. It makes you to read time easily no matter distance. And the brightness of screen is adjustable, it's convenience for you to operate the brightness settings. ➤【Large Digital LED Screen Display with Dimmer】- With 180° adjustable angle allows you to project ultra-clear time onto ceiling or walls. When the time is displayed inverted, press the button again, it's direction will be right. The time display with 12/24 format, the blue projection light is soft and the brightness adjustable.Exquisite design, the projection rotating wheel is comfortable to grip. ➤【FM Radio with Sleep Timer】- FM radio can store up to 10 FM stations from the wide range of free programming (FM: 76.0-108.0MHz), including some radio stations in Europe & America. Designed with the sleep timer (5-90minutes), you can fall asleep with your favorite preset one. The volume of the radio can be adjusted, and the adjust button is comfortable and effortless, easy to operate. ➤【Alarm Clock with Snooze Function】- Projection clock makes it possible to wake you up with a natural sound instead of buzzer noise. Just push the button through your fingers, you can switch the alarm clock to snooze state. There is a non-slip pad at the bottom to prevent to slip off from the bedside table. ➤【USB Charging Port】- Built-in USB port is convenient for you to connect your iPhone, iPad and other smart devices to it for automatic charging. And it also comes with a battery backup system, the backup battery with memory function can only backup time and alarm setting in case of power failure.